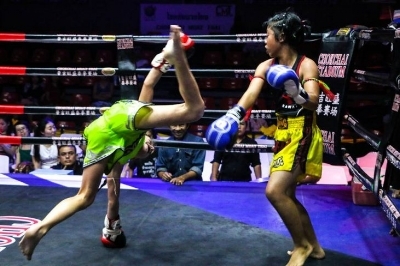 She has 28 amateur fights (24-3-1), 2 pro full rules fights (2-0), has been training near-daily for the last five years, and is notorious for utilizing Saenchai’s cartwheel kick in the midst of a bout. Not to mention, she’s only ten years old. It’s Jodie McCarthy’s world, and we are just living in it. Nicknamed “The Beast” by her father, Jodie has been training for literally half her life. 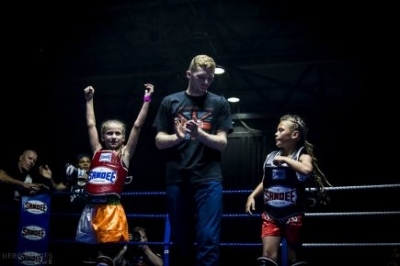 She began her journey at five years old, training MMA at Samson Martial Arts in Ireland. Like most children, she tagged along with her father when he would go to train Brazilian JiuJitsu. Little did anyone expect for the Kindergartner to pick up the sport so quickly and become as dedicated as she is today. At six years old, “The Beast” began training Judo and continued until she was about eight. The yellow belt came across another martial art that she loved, and it soon took up all of her time and attention: Muay Thai. “Girls can do whatever they want,” Jodie says after her weekly training has come to a close. The pint-sized fighter maintains the same training schedule as a pro athlete, but also has something that Cris Cyborg and Joanna Jedrzejczyk don’t–homework. Not only does she train at Samson’s, but also spends time with Martin Rooney’s Training For Warriors. “The Beast” is in the gym for two to three hours per day, utilizing everything from Thai Boxing to bettering her JiuJitsu. Mondays are her rest days but she attends school every weekday and has to have her homework done before she goes to sleep. 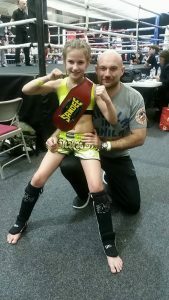 As the world of fighting evolves to include women, and fathers such as Dan manage and train their daughters, there are still setbacks that many fighters are looking to overcome. Oddly enough, in Jodie’s home country of Ireland, the “Fighting Irish” are against MMA and are attempting to get it banned. 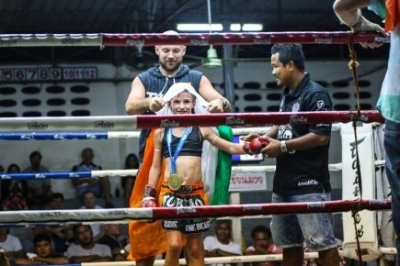 Despite the backlash that fighting faces in Ireland, Jodie has received many a warm welcome in Muay Thai’s homeland of Thailand. Her two pro fights were held in the country, and the cheers for her were louder than for her native-born opponent. Well-known within the Muay Thai scene, McCarthy has had everyone from Valentina Shevchenko to Stephen “Wonderboy” Thompson congratulate her on her wins. A video that went viral showed her boxing a cow’s carcass, a la Rocky Balboa, that helped to put her on the map. Jodie can count fans from all over the world, who adore her walkout style of sunglasses and Irish flag tied like a cape around her neck, and ask for pictures when she is out and about.